Also earning bracelets yesterday were Jeffrey Smith of California, winner of Event #9: $1,000 No-Limit Hold’em, and Maryland’s Brock Parker who earned his third career bracelet in the Event #10: $10,000 Limit Omaha Hi-Low Championship. Just nine remained from the 7,977 entries who entered this year’s installment of the “Millionaire Maker,” the only ones left to chase the dream shared by all who entered of landing the $1,319,587 first prize. And with a final table full of wild swings, lead changes, and dramatic hands, Event #8 concluded in appropriately exciting fashion. Maurice Hawkins started yesterday with a short stack but high hopes, sharing some of his pre-final table thoughts beforehand with PokerNews. But after running pocket queens into Stephen Graner’s pocket kings, his run ended with a ninth-place exit. Graner, meanwhile, had hopes as well yesterday, bolstered by his having started the day with a huge chip lead, sitting with well over twice the stack of his nearest challenger, James Duke, and about a third of the chips in play. Alas for Graner, he’d lose significant chips early then ultimately called off his stack on the river in a hand versus Dimmig with a lesser straight to finish in sixth. Duke would emerge as the chip leader as play wound down and Andrew Teng fell in fourth to Dimmig in a hand that saw Teng open-push just over 20 big blinds from the small blind with and get called by Dimmig who had him barely covered and held . The flop paired Teng, but the fell on fourth street to give Dimmig an unbeatable set and send Teng out in fourth. Dimmig would catch Duke and then knock him out in third, then won a big all-in on the first hand of heads-up to double versus Coburn and grab the lead, and five hands after that would take the last of Coburn’s chips and the bracelet. Just 12 were left from a starting field of 1,940 to return to yesterday’s final day of play in Event #9, with Jeffrey Smith managing to outlast all including a gritty heads-up competitor in Danny Nguyen to earn the victory and $323,125 first prize. Smith and Nguyen’s duel punctuated an exciting day of poker that began with the knockouts of Vinny Pahuja (12th), Dylan Linde (11th), and Cornel Medes (10th) — each earning $18,472 — to set up the final table. 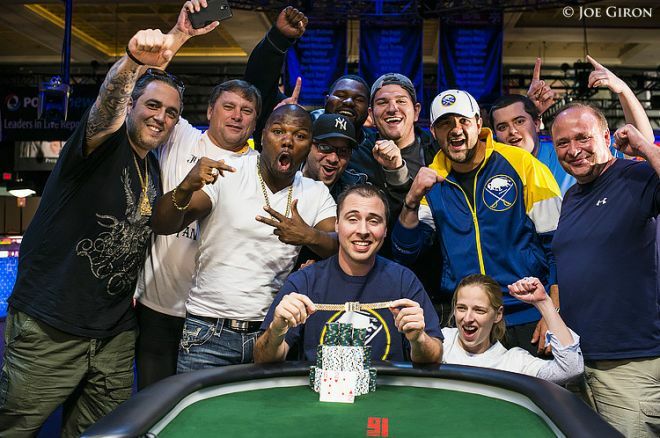 Chris Hunichen would later fall in sixth, exactly matching his finish in last year’s “Millionaire Maker.” Nguyen then later eliminated start-of-day chip leader Frank Patti in third, to set up what would become an epic-length heads-up battle. Smith and Nguyen would fight for three hours and 155 hands with the lead changing hands several times along the way. Finally Smith was able to knock out his opponent after his held against Nguyen’s to win the bracelet. There were 18 left from the starting field of 178 in Event #10, and early action on the tourney’s final day saw bracelet holders Perry Friedman (18th, $23,742), Jeff Lisandro (17th, $23,742), Andrew Brown (14th, $28,176), and Eli Elezra (10th, $33,949) among the players coming up shy of the final table. That left three more former WSOP winners to take part in the final table, with Dan Kelly (9th) going out quickly while Richard Ashby and Brock Parker battled onward toward a heads-up duel. Melissa Burr (8th) and Shirley Rosario (4th) also went deep in this one as the last women to be eliminated from the event. 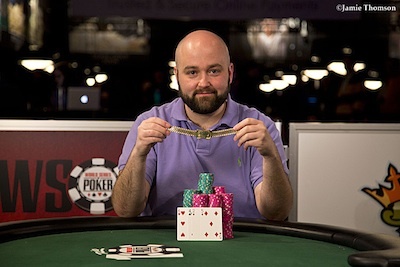 Parker had a slight chip lead to start heads-up play with Ashby, but the latter quickly seized the advantage and had close to a 2-to-1 edge for a time before Parker battled back, then ultimately denied Ashby a second career bracelet to claim the win. 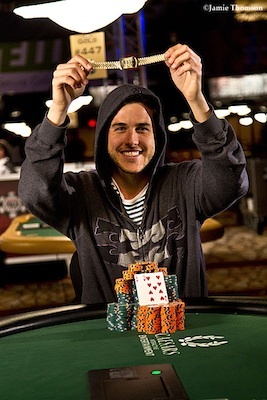 Parker won his first two bracelets within the space of a single week back in 2010, and now joins Vanessa Selbst and others as a three-time WSOP bracelet winner. This marks Parker’s second final table this year as well after having finished fifth in Event #7: $1,500 Seven-Card Razz, and thus he becomes an formidable contender early on in the WSOP Player of the Year race. PokerNews fans can grab some RunGoodGear on a discount during the World Series of Poker. Simply use the promo code ”pokernews” for your next order and receive 10 percent off. That's right, all you have to do is type ”pokernews” into the promo code box and 10 percent of your order goes right back into your bankroll. While bracelets were being won elsewhere in the Rio All-Suite Hotel and Casino on Tuesday, Day 2 of Event #11: $1,500 Six-Handed No-Limit Hold’em saw a returning group of 134 play down to 10 players, with Mike Sowers enjoying the current chip lead with Event #5: $10,000 Limit 2-7 Triple Draw Lowball Championship runner-up Justin Bonomo and Taylor Paur nearby occupying the next two spots in the counts. Among the notables going deep but coming up short of today’s final day of play in Event #11 were Corey Burbick (13th, $17,139), Hans Bosman (18th, $17,139), Jason Wheeler (19th, $13,390), and Amnon Filippi ($13,390). Event #12: $1,500 Pot-Limit Hold’em got started yesterday with 557 entrants taking part, up from 535 in this event one year ago. That group created a total prize pool of $751,950 to be divided among the top 63 finishers, with the winner scheduled to receive a handsome $169,225 payday. They got close but didn’t quite reach the money last night, finishing with 69 players remaining with David Martirosyan ending with a leading stack just barely ahead of Matthew Damadeo. Others bagging lots of chips last night were Joseph Cheong, Ryan D’Angelo, Jesse Yaginuma, and Darryll Fish. Finally the Event #13: $10,000 No-Limit 2-7 Draw Lowball Championship got started as well late yesterday afternoon with the tournament drawing 87 entries — exactly the number who played the same event in 2013 — thus building a prize pool of $817,000. Only the final 14 will get paid in this one, with $253,524 up top for the winner. By night’s end 36 players remained with two-time bracelet winner Jennifer Harman leading the way with a host of familiar names still spread all up and down the counts. Today just four events will be in action, highlighted by the finale of Event #11: $1,500 Six-Handed No-Limit Hold’em. Events #12 and #13 continue with Day 2s, while one new event, Event #14: $1,500 Limit Omaha Hi-Low begins.